"Kush-Kaya mountain translated from Turkic means "Bird's mountain", it is situated above Batiliman and Laspi bay on the 30 th km of Sevastopol — Yalta road. Due to Kush-Kaja, which protects this area from northern winds, Batiliman is famous for its warm microclimate. It is especially appreciably in winter when on the Laspi pass there is a lot of snow and piercing wind, and in the meantime below, under the rocks of Kush-Kaja, the weather is wonderful for training and even for sun tan. All the lower rocky level of Kush-Kaya with height of 30 - 100 m has been noticed by the alpinists and climbers as an excellent place for trainings and competitions. Descent from Kush-Kaja mountain can be done by paths on the both sides if the peak. More convenient path climbs down Kush-Kaja mountain to Laspi bay. Unhurried descent takes about 30 minutes. " From the book of А .N.Sherbakov "Rocks near the sea". You can go to the route on the right: along the ledge ("first football ground") under the red rocks (see " Крокодил ", " Шкуродер " V grade ), or on the left along the big couloir. 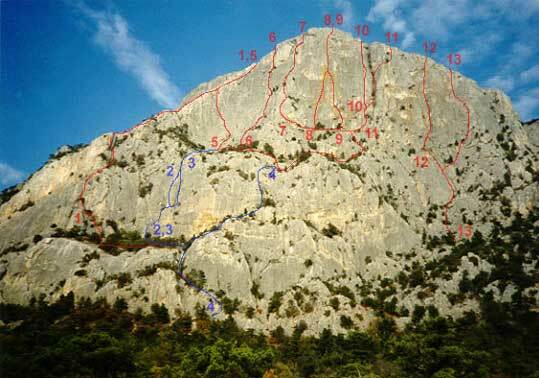 The most difficult part of the route is the first pitch. Ascend 20m upwards from the ledge along the corner (IV), then go along the cracks to the small ledge under an overhanging wall — RI. Then go through the ridge to the left and by the divided rocks ascend to the pine-tree. After the pine-tree go to the left along the big couloir to the ridge ( 100 m ). Ascend 60m by easy rocks of the ridge till the break (I). After the tree above the break ascend 8 m , crossing to the left the nail slab on your right ( 8 m , 75", IV). 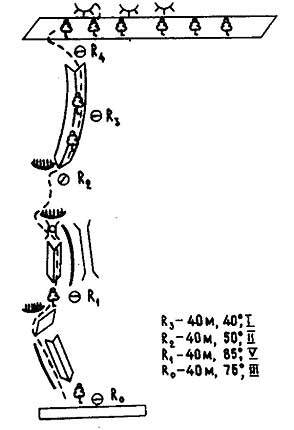 Then go120 m along the ridge to the ledge е under the upper big cornice — R7. Then you can move upwards, bypassing the cornice by the corner on the left (IV), or by horizontal traverse go (10m, IV) to the left on the crack, leading to the tree, and then by easy rocks ascend 20 m to the plateau. The route starts from the big ledge ("first football ground "), located above the lower rock level. The ledge is well seen because of the red rocks above it. You can reach this ledge ascending firstly right to left along the narrow ledge with trees (60m), and then go 20 m upwards by easy rocks. Ascend 15 m along the small buttress in the left part of the ledge, then traverse to the right along the slab to the narrow ledge, leading to the tree in the base of the big corner. Ascend 40 m along the cracks of the corner (middle and big nuts) — R2. Another variation goes along the narrow chimney to the right from the corner (V grade) "Шкуродер" (Shkuroder) . From R2 go by quite easy rocks to the чашу (cup) (80 m). серая чаша (gray cup) is a wall between "the 2-grade ridge" and the central buttress of the wall. It is the easiest approach to " второе футбольное поле " (second football ground) , where the difficult routes of Kush-Kaya start. Ascend to the big ledge under the red rocks ("first football ground")(see. "Крокодил", "Шкуродер" V grade ). Go along the ledge to the right and upwards to the ledge — R0. Then go upwards by the corner 80 m (II-III) to the terrace under the wall. 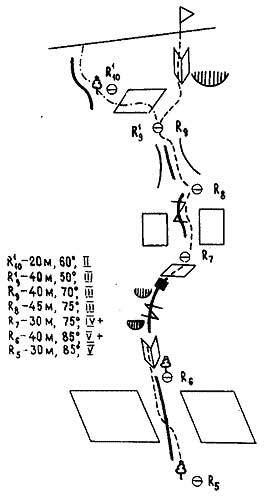 Go along the ledge system to the right to the direction of big break and come to the ledge with a big deciduous tree, growing near the base of the break — R3 (under "the right trouser lag ( штаниной )" ). If needed, from the beginning of "the right trouser lag " you can go by the easy ledges and cracks (to the right and upwards) to the ledge in the base of the big chimney. "второе футбольное поле" (second football ground) - a wide ledge with trees in the middle of the wall. « Штаны » (Trousers) - yellow rocks in the center of the wall look like trousers. 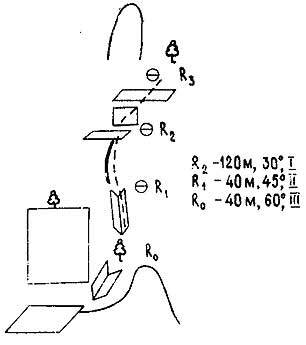 Entering the чашу (cup) , move along the inclined slabs (50°) to the corner, made by the right and the left walls of the cup. R5 point is near the pine-tree in the base of the corner. From R5 ascend 30m upwards along the corner, then go along the left wall to the small bush - R6. Then ascend and go to the right by the difficult rocks to the corner, turning into the crack. On this way go near two cornices (V+AI). Belay point is on the uncomfortable ledge — R7. From the ledge go 40m upwards along the crack system to the " двоечный " (2-grade) ridge (R8,R9, or R9',R10'). серая чаша (gray cup) – a wall between "the 2-grade ridge" and central buttress of the wall.